Gur padi or Sukhdi or Gol papdi recipe a sweet that is made with wheat,ghee and jaggery. 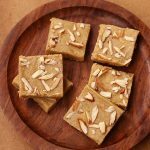 Grate jaggery measure and set aside along with cardamom powder.Chop almonds and keep it ready.Heat ghee in a pan. Add a pinch of wheat flour and see if it bubbles up then its perfect.Add wheat flour and keep roasting in low flame. Roast until it turns a little darker in shade may be for 3-5mins.Switch off and keep the pan off the flame. Do all this off the flame :Now add jaggery and cardamom powder. Mix well until jaggery is evenly mixed.Immediately transfer to a greased tin and level it. Sprinkle chopped almonds, and using a flat bottomed bowl level it.I used a parchment paper over it then levelled it. When it is still warm cut with a greased knife.Cut into small squares.Cool down then store. After adding jaggery be quick just mix well and transfer and level it else it will crumble and burfi can't be shaped. The authentic sukhdi recipe does not use any flavouring so if you want you can even skip cardamom powder.You can even replace cardamom powder with nutmeg powder. Use powdered jaggery or grated jaggery so that it gets easily mixed.